Wohl Associates announces new pre-owned packaging machinery to their inventory. Their line of packaging equipment includes tablet packaging equipment, unscrambling tables, Simplex piston fillers and additional used machinery. There is huge demand for used packaging machinery and they are ideal for new or smaller businesses with a low budget. Wohl Associates has emerged as the leading name in the used machinery dealer business. Their expanding line of inventory includes items such as cartoners, colloid mills, liquid filling machines and Simplex piston fillers. New to their inventory in 2013 is packaging machinery. While Wohl Associates has been known for buying and selling used package machinery, 2013 has brought a stronger focus on this line of pre-owned machinery. Customers can choose from a wide range of used packaging equipment such as Axon sleevers, induction sealers, bundlers, vacuum packagers, and other packaging machines. “There is huge demand for used packaging machinery and they are ideal for new or smaller businesses with a low budget,” says John at Wohl Associates. Packaging is the science of enclosing a product for distribution and not only protecting the product by making it useful. Wohl Associates searches factories, warehouses and production lines in search of quality used packaging equipment to offer their customers. Wohl Associates understands the high demand for used packaging equipment such as bottle fillers, induction sealers and sleeving systems. With an assorted inventory of quality used machinery, the company provides a solution for budget conscious companies to acquire quality packaging equipment on a budget. 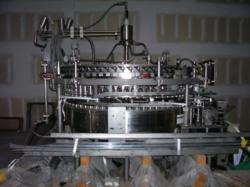 One of the new pieces of packaging equipment is the Beer High-speed Canning Line machine. It was purchased by Wohl from a factory where it was set to can 500 cans per minute. Consisting of a Crown 72 valve filler and Angelus 121L can closer, this unit is ready to improve a company’s canning productions. Its previous setup handled 355ML and 473 ML size cans. Wohl Associates also sells tablet packaging equipment and unscrambling tables to their clients who are in the pharmaceutical industry and require sophisticated packaging equipment for their products. Wohl Associates tests and submits each machine through a rigorous quality check to assure each machine is in perfect working order. In addition to packaging, Wohl Associates also sells used sanitary tanks, pressure tanks, insulated tanks, vacuum tanks, and agitated/mixing tanks. These units are used in many fields such as ethnic food manufacturing, meat processing & packing, oil & fat industries. The used machinery from Wohl Associates is guaranteed to arrive in working condition and be in working order. Wohl is one of the few used machinery dealers who also specializes in providing appraisals for clients. Whether they need an appraisal for insurance reasons, buyouts, loans or mergers, Wohl Associates can assist with a qualified appraisal. They can structure the appraisal either on itemized equipment basis or as a general lump sum, depending on the client’s needs. Wohl Associates has been a family- owned and operated business for over 40 years. They have earned a reputation as a trusted leader offering quality equipment, expert customer service and invaluable knowledge of the pre-owned packaging and processing machinery industry. They take pride in maintaining long-standing relationships with customers and recognize the need to treat each customer individually to provide the highest level of service. To view their inventory and learn more, visit them at http://www.wohlassociates.com/.